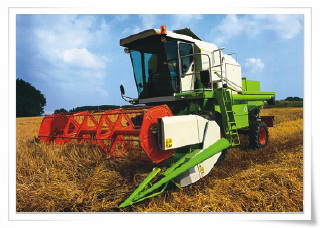 Applications - CSB Sliding Bearings India Pvt. Ltd. These days, the application of the lubricant free technology (air bearings, oil impregnated bearings, solid lubricated bearings, plastic bearings, etc.) is significantly expanding into many different industries. CSB developed the bushings specially for the applications of the hydraulic components such as gear pumps, piston pumps, vane pumps, compressors and hydraulic cylinders. These metal-polymer composite bearings are most suitable for the working condition with fluid lubrication environment with high load and high operation speed. 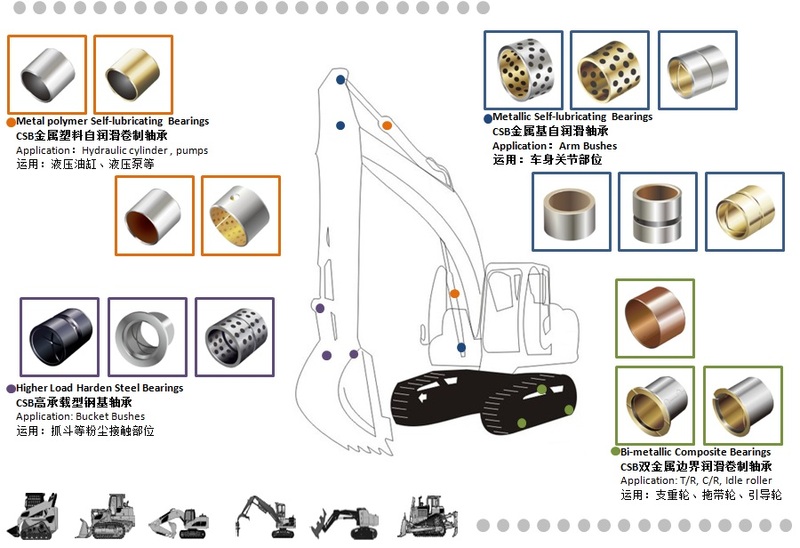 With the cooperated study and research, together with the customers, CSB has been successfully developed the most suitable bearings for the wheels, rollers, lifting arms, hydraulic cylinder bushings for the construction machineries including boundary lubricating bi-metallic bushings, metallic bushings and metal-polymer composite bushings. These bushings are made with the optimized wear resistance and dust protection features. The self-lubricating characteristics of the bearings provided considerable savings by expanded maintenance period and therefore make the machines working with higher efficiency. CSB metal-plastic composite bearing gives full play to characteristics of long service life, maintenance free, long maintenance cycle and low cost in occasions of poor environment and difficult refueling. Sealing element is suggested to be installed with the bush assembly to prevent the invasion of containments. Typical applications: Van Carrier, Stacking Machine, Lifting Platform, Port machine and so on. 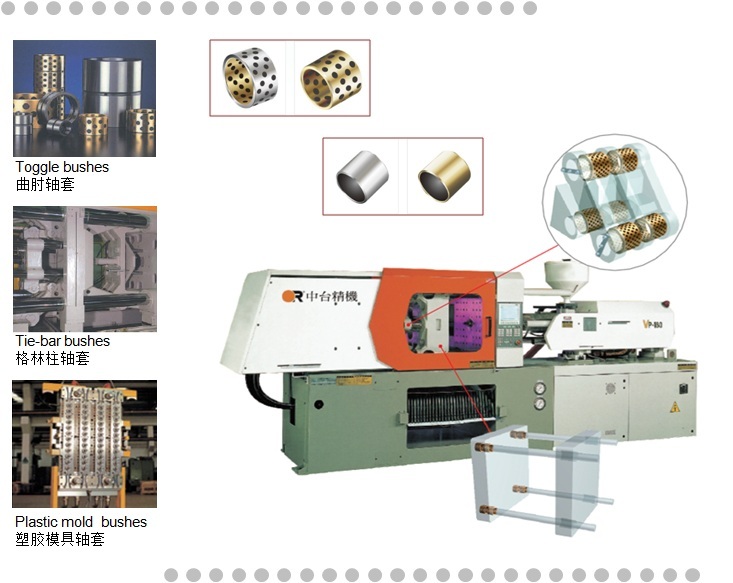 CSB first brought self-lubrication concept into plastic machinery field in China since 1995 and started to supply bushings to the world top five injection plastic machinery manufacturers with the materials including CSB-650, CSB-850 and CSB-50. The low friction, high load and long lasting features of the maintenance free bearings provided a reliable guarantee for the relative machines. CSB Self Lubricating bearing is commonly used for rotating and sliding worktable parts of machine tools, providing good guidance and maintenance-free self-lubricating operation guarantee for the machines. 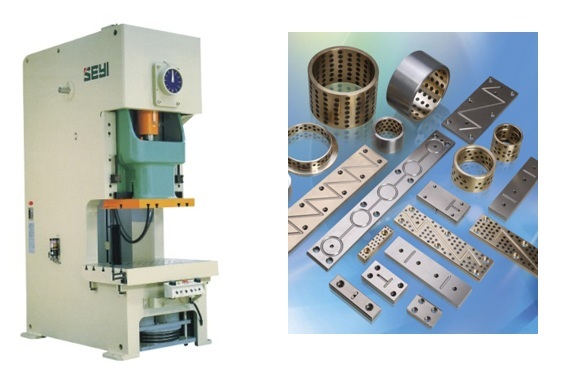 Its low friction and optimized performance provide a considerable cost saving and at the same time, improves the noise level of the machines during the operation.